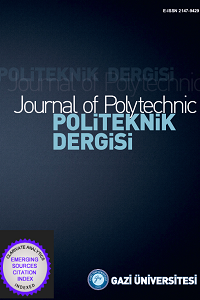 Journal of Polytechnic-Politeknik Dergisi accepts scientific original articles in Turkish or English in order to create scientific communication between scientists working in the fields of Science and Engineering. Technical Note: Articles describing a new method or technique explaining the important findings of a research. Copyright of all manuscripts must be filled out by all authors of the manuscript and submitted to the editor. Publications of the Authors that do not signed the Copyright Agreement Form are not processed. No add-ons can be made by the authors on the articles that were decided to be published. Each article is sent to at least two referees in terms of form and content. The articles that are determined to be published in the journal are prepared for publication. 1. TEXT should be written in Times New Roman font and 12 pt, not exceeding 20 pages except for review articles including references and figures. Authors should state what kind of article his/her article is. 2. TITLE of the work should be written in Turkish and English, the first letter of which must be capital, and the title should be short and clear. 3. ABSTRACT should be written in Turkish and English, not exceeding 200 words. 4. KEYWORDS: At least 3 maximum 5 keywords should be given in Turkish / English. 5. COORDINATION of the MANUSCRIPT: Generally covers the introduction, method, findings, conclusion and discussion, respectively. 6. REFERENCES: In the text ,  etc. numbers should be numbered and written at the end of the text. If the reference is an article: the first letter of the author's surname, authors’ name, the full title of the article in quotation, the name of the journal (if available international abbreviations), volume no: start and end page of the article, (year). Example: Sözen A., Özbaş E., Menlik T., Cakir MT, Guru M. and Boran K., '' Improving the thermal performance of diffusion absorption with alumina nanofluids '', International Journal of Refrigeration, 44: 73 -80, (2014). If the reference is a book: the first letter of the author's surname, author’s name, title of the book in quotes, the volume no, the editor, if any, the name of the publisher, the publication number, the place of publication, (year). A section from the reference book: The first letter of the last name of the author of the section, author’s name, title of the section in quotation, the name of the book from which the department was taken, the name of the publisher, the place of publication, (year). If the reference is a published thesis: Name of the author's surname, author’s name, title of the thesis, the type of the thesis (master, doctorate), the university and institute where it is presented, (year). If the reference is a proceeding: the first letter of the author's surname, authors’ name, title of the paper in the quotation, the name of the congress, the place where it was made, the beginning and ending page of the proceeding, (year). If the reference is a standard: the standard number, the name of the standard in quotation, (year). 7. TABLES & FIGURES: All images without charts (photographs, drawings, diagrams, graphs, maps, etc.) should be named as Figure. Each chart and figure should be placed in the text. All figures should be numbered consecutively within the text. 8. FORMULAS & UNITS: All formulas in the text should be written in equation format. Formulas (1), (2) should be given the sequence number. All units must be in the SI unit system. 9. NOMENCLATURE can be given at the end of the text before the REFERENCES. 10. ACKNOWLEDGEMENT: If people or institutions are to be acknowledged, they should be written in this section and given before the REFERENCES.